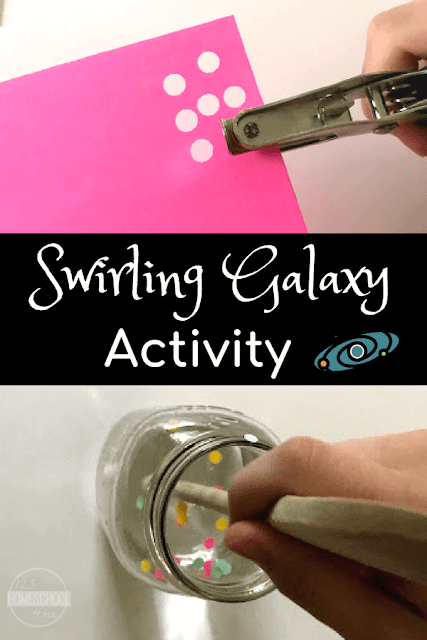 Bring the wonder of outer space into your home with this fun swirling galaxy activity that shows kids how spiral galaxies get their shape. I have always been fascinated by outer space. I love stargazing on a clear night, getting up in the wee hours to get a glimpse of meteor showers, and visiting the local observatory to see through their powerful telescope. These are things I have enjoyed since I was young. Now, I drag my own kids out to try and foster a love and appreciation of the vastness of space in them, as well. One of my favorite websites to visit and browse is the NASA image gallery. This is a searchable database of official NASA photographs of everything from NASA spacecraft to deep space images from the Hubble Telescope. I gravitate toward the images of far away galaxies. This is one of my favorites. This is an image taken by the Hubble Telescope of distant, interacting galaxies called Arp 273. 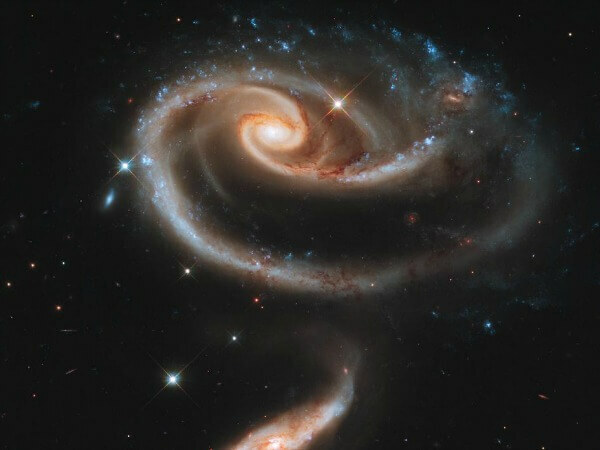 These spiral galaxies are so close together that the gravitational pull of the smaller galaxy, UGC 1813, has distorted the shape of the larger one, UGC 1810, so that it looks like a sort of rose. Simple, fun, and beautiful Swirling Galaxy Science Project kids of all ages will love! 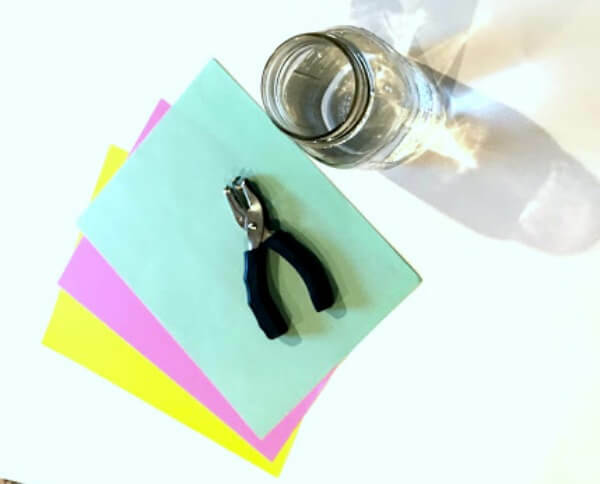 To recreate the spinning of these spiral galaxies, grab a few simple supplies: colored paper, a hole punch, a quart jar filled about 2/3 with water, and a wooden spoon. Punch 20-25 holes in various colors of paper. The resulting paper circles are your stars, planets, and space dust. Then, drop your celestial bodies into the water. Carefully, stir the water and the paper circles in a swirling motion with the handle of the wooden spoon. Try to not push the paper under the water. You want the your space objects to float. 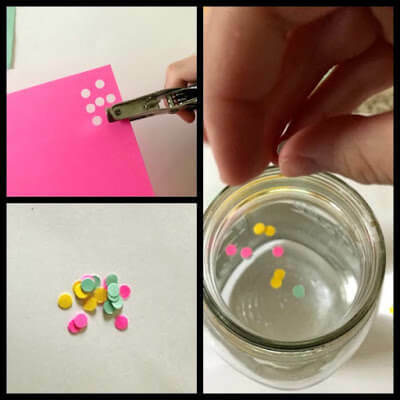 When the paper starts swirling, stop stirring and quickly remove the spoon. Now, be amazed by your own swirling, spiral galaxy! You should see some expansion of the paper circles as they move away from the center point. Keep trying this until you see a spiral form. Galaxies are huge groups of stars, gas, and dust held together by a gravitational force. Our own Milky Way galaxy is estimated to be made up of over 300 million stars and is 100,000 light years in diameter. Yet, there are known galaxies that are much, much larger. The Hercules A galaxy is 1.5 million light years in diameter! The universe is so vast that we do not know how many galaxies actually exist. The Hubble Telescope has revealed over 100 billion galaxies, but that number is estimated to grow to over 200 billions as technology to discover them advances. These billions of known galaxies can be separated into a few distinct types. The most common, and the one I think of when I picture a galaxy in my mind, is the spiral galaxy. Spiral galaxies, like our own Milky Way, consist of a rotating center disc with spiraling arms extending out from the center of the galaxy. It is this rotation that we re-created in this activity!